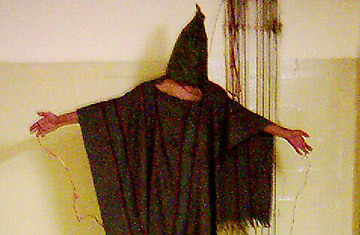 An unidentified detainee at the Abu Ghraib prison in 2003, Baghdad, Iraq. Last month, Gibney's film Taxi to the Dark Side won the 2008 Academy Award for "Best Documentary" for its exploration of the Bush administration's policy on torture and interrogation at Guantanamo, Abu Ghraib and Bagram Detention Centers. He dedicated the film to its central character, a 22-year-old taxi driver from Afghanistan who was detained and later beaten to death by American soldiers in December 2002. I think "Taxi" is a really a film about the corruption of the American character and how a few rather weak and panicked leaders  meaning the highest ranking members of the Bush administration  decided to pursue a policy of torture and illegal detention, which ended up not only damning us with bad intelligence, but also corrupting our rule of law. So in that sense, it's not purely an "Iraq" film. It's a film that journeys from Afghanistan to Abu Ghraib in Iraq to Guantanamo to the White House. What the film does is show how [those abuses] were not the result of a few bad apples, but are deeply connected to policies that originated in Washington and were pursued in Afghanistan and Guantanamo and elsewhere. I expected, initially, not to like them. Some of these guys, after all, had beaten a very fragile young man to death. And yet, I came away from my very long interviews with them being very sympathetic to the position that they had been put in. They had been sent over to Afghanistan and Iraq with very little cultural training, very little understanding of what their mission was, very little understanding of how and why they should do what they did. And they were pushed into doing things that, if you had asked them back home, they never would have done, or never would have wanted to see. So they come back very haunted, sometimes broken men. I'm astounded by this whole debate over waterboarding, and this insistence by the administration that they want to preserve the right to do so, even if it�s at some future time. Waterboarding is torture. John McCain just said that on "60 Minutes" last night. It's clearly torture, and it�s clearly illegal. And the idea that [U.S. Attorney General] Michael Mukasey  the highest law-enforcement official in the land  would say that he's "not quite sure" whether or not it's legal is astounding to me. I think we've gone a long way  or this Administration has gone a long way  in shocking the rest of the world at the kind of depravity that we're willing to entertain.